I like this. It's perl. It's clean. It works well at 16px. It is indeed memorable. Well done. 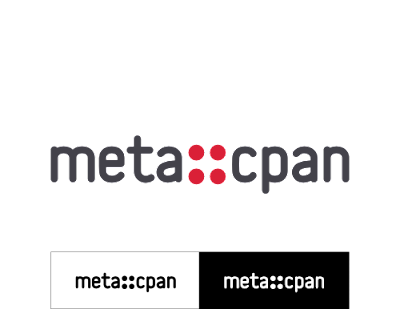 Can it be Meta::CPAN instead of meta::cpan? It's lowercase so it must be functioning as a pragma. Best entry so far! It's got my vote. I also think that this is the best entry so far. I'm curious to see the "Meta::CPAN" variant as zorgnax suggested, and maybe also a different color scheme. Profesional. A succeseful and powerful logo. Great work! Hello guys, all requirements will be met, but because I haven't used a font for the text I'm forced to design M, C, P, A, N glyphs from the scratch. Next week I will come with two versions that I think will meet the above requirements. For the chosen color scheme I had some good reasons, but if you have other ideas I'll accept them with pleasure. I really like this one: looks professional, very clear to read, the full logo scales well to different sizes, the “::” means something in the context of Cpan, and the favicon is a proper symbol (rather than just letters). Personally I think it's good in all lower-case. Yeah this is great. To state the obvious: the dots are fantastic as they are the key syntax used for packages. Regarding capitalization, I vote for meta::CPAN. I really like this one. Probably my favorite. The dots work well as an iconized version of the logo. And it looks good both in b/w and reversed. Personally I'd keep the lowercase font. I realize CPAN is an acronym, and therefore should be capitalized, but esthetically it works better all lowercase. Nicely balanced with the 1 letter on each side having a ascender/descender.